Any impartial observer unfortunate enough to visit Imo State today will be forgiven for thinking that Hitler's Third Reich has been resurrected in the peace-loving central region of Biafraland. 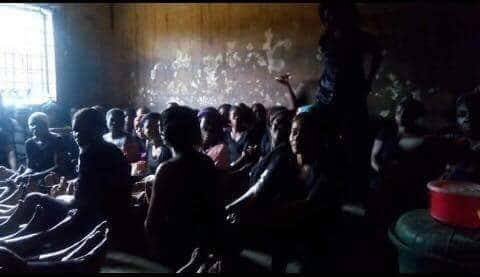 The gestapo style round-up of innocent mothers during a peaceful protest, their unlawful detention by the government, ongoing torture and humiliation of the entire Igbo race, has taken another more sinister step. The forced pregnancy test for all the women including grandmothers, announced by the prison authorities, is a devilish and sinister intrusion into the health of our mothers reminiscent of the fate Jewish women endured in Concentration Camps in Europe during the Holocaust. It is common knowledge that this Buhari regime has done and is still doing everything within its powers to eliminate as many Biafrans as possible. The mass murder of IPOB family members by Buratai's Nigerian soldiers in Igweocha (Port Harcourt), Nkpor, Enugu, Onitsha, Aba, Umuahia, Mbiama Bayelsa State is still fresh in our memory. This latest plan to forcefully subject our mothers and grandmothers to pregnancy test is part of a wider ploy to contaminate and infect them with diseases that may prove incurable in the long run.